NASA’s new series of bullet-shaped “X-planes” are the first step towards trying to resurrect the dream of supersonic air travel. The agency has been on a years-long mission to replace the Concorde, the expensive supersonic plane, which was decommissioned in 2003 over concerns that it was uneconomical, and just too darn loud. 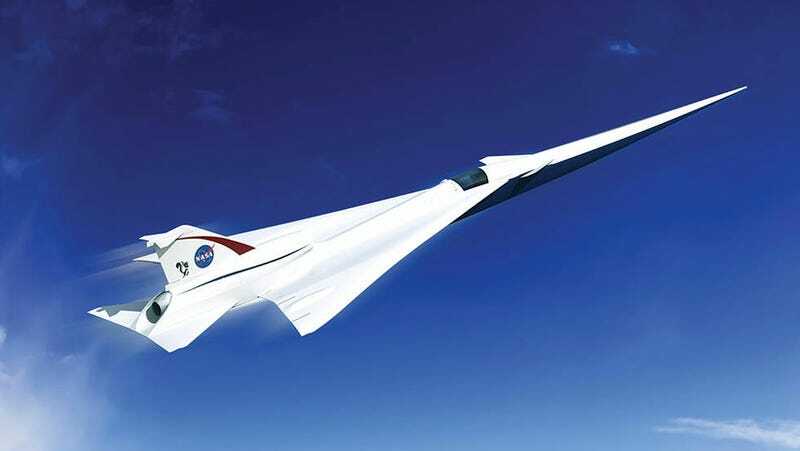 The X-plane itself is a concept for the first plane using what NASA calls Quiet Supersonic Technology (or QueSST). Designers Lockheed Martin will receive $20 million over the next 17 months for preliminary design work with the hopes of having a complete design by 2017 and a working aircraft as early as the fall of 2019, according to USA Today. However, these test aircraft will only be half the size of commercial airliners and will only have room for the pilot, which is why the above image looks so small. But the goal is to fly at Mach 1.4 or 1,100 mph (almost double the speed of current airliners) and be completely inaudible when cruising at 40,o00 feet. Of course, NASA’s had a long history of wanting to create a new Concorde for the next generation of air travel, and that ambition has come with some equally ambitious designs. Hopefully, the QueSST jet is the one that will finally get off the ground.